Both Rootmetrics and JD Power released separate reports this week that focus on the consumer experience and network quality from U.S. wireless carriers. The reports peg Verizon as the clear winner in both situations, while Sprint and T-Mobile struggled to even remain in the conversation. AT&T faired well, but still remains in the distance from Verizon in overall rankings, especially in the reliability category. You may remember AT&T’s “we are the most reliable network now” campaign? According to these reports, that campaign should end now if it hasn’t already. The Rootmetrics report creates a score that reflects overall coverage and consumer experience. Verizon’s overall score ended up at 89.7 with AT&T closely behind at 86.2. Sprint and T-Mobile managed to pull in scores of 68.2 and 64.3, respectively. Quite the distance, right? As you can imagine, T-Mobile execs, including CEO John Legere, have already criticized the report, stating that these tests were done before they made all their end-of-year improvements. In the JD Power report, scores were given by region, with Verizon topping the charts in all six regions (Northeast, Mid-Atlantic, Southeast, North Central, Southwest and West). These tests focus on network quality as reported by over 25,000 wireless customers. These customers reported on things like slow download speeds, dropped calls, audio issues, web connection errors, and lost calls, to name a few. The data for this report was collected from July 2013 to December 2013, so you can imagine how T-Mobile feels about this as well. 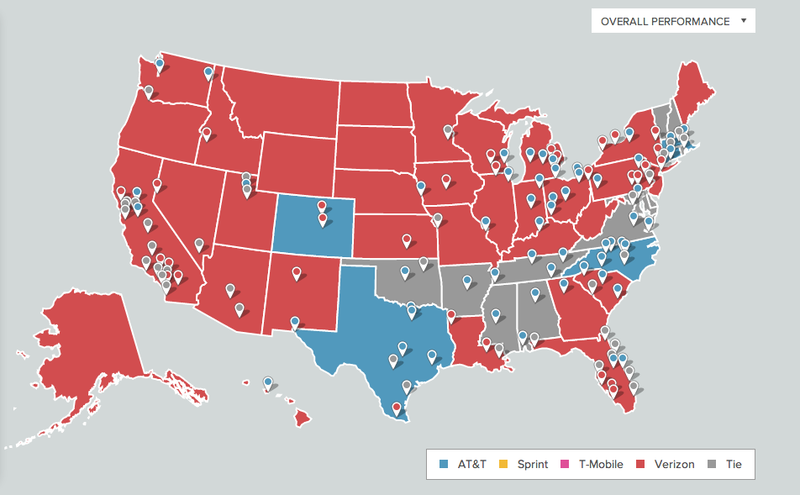 Again, Verizon topped each region by what appears to be a wide margin. AT&T came in second in each, while Sprint and T-Mobile flip-flopped for third and fourth place in many. We had a reader suggest that reports like these may be the reason that Verizon can still charge its high prices on data and other services. I’ll just say that’s it not only these reports, but the continued increase in new wireless customers that are reported in each of their quarterly earnings calls. Big Red isn’t slowing down, so they don’t need to result to the drastic changes that T-Mobile and AT&T have made over the last year.